Plagiarism: The appropriation of another person’s ideas, processes, results, or words without giving appropriate credit. Misrepresentation of the scientific evidence, by omitting parts of it, falls under the definition of the ‘scientific misconduct’. The newly re-designed (in the end of 2015) website of the Finland’s STUK – Radiation and Nuclear Safety Authority (Säteilyturvakeskus), by purposefully omitting important and relevant information, engages in the ‘scientific misconduct’ and the ‘scientific misinformation’. The information concerning the biological and health effects of the EMF has been re-written and absolutely all the information concerning ‘electromagnetic hypersensitivity’ was removed. Any Finn, visiting STUK website, will not find any reference to EHS (in Finnish: SYH). 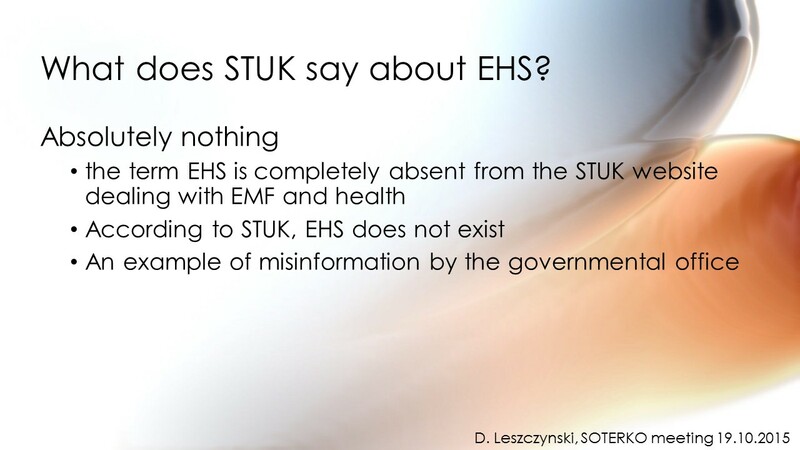 According to STUK the EHS does not exist and never did exist too. STUK is a governmental agency obliged to provide reliable information for Finns about any and all aspects of radiation, whether ionizing or non-ionizing. Complete omission of the EHS from the STUK website equals scientific misconduct. STUK administrators may consider EHS as unrelated to the EMF exposures, it is their opinion. However, the EHS phenomenon as such should be mentioned on the website with an appropriate explanation, what it is or what it is not, in the opinion of STUK. The problem of EHS missing from the STUK website is not new and STUK was made aware of this problem. Several months ago, at the meeting of the SOTERKO group in Finland, in the presence of the representatives of the Finland’s Ministry of Health and Social Affairs (STM) and the representatives of STUK, in my invited expert presentation I informed STM and STUK about the EHS missing from the STUK website. I asked STM and STUK to add the information on EHS to the STUK website. Otherwise, instead of providing information STUK provides biased misinformation. As of today, March 15, 2016, the information about EHS remains missing from the STUK website. This means that STUK, with the apparent permission of the Finland’s Ministry of Health and Social Affairs, is engaged in the misinformation campaign that has clear signs of the scientific misconduct (omission of information). The issue of EHS is present on the websites of the WHO, ICNIRP and other agencies, irrelevant of their scientific opinions about the causality link between EHS symptoms and EMF exposures. Why STUK is different and propagates misinformation and misconduct? This entry was posted in Mobile phones and health and tagged EHS, Finland, Ministry of Health and Social Affairs, misconduct, misinformation, Radiation and Nuclear Safety Authority, Säteilyturvakeskus, SOTERKO, STM, STUK, SYH by dariuszleszczynski. Bookmark the permalink.